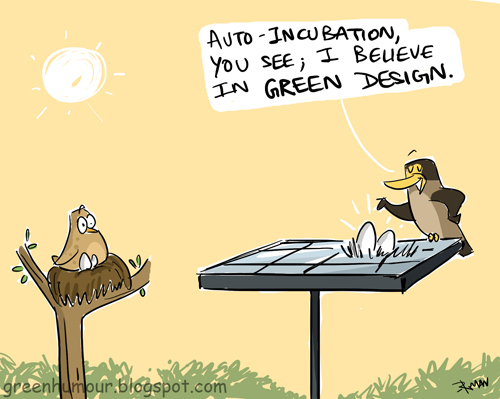 Green Humour: Happy World Environment Day! Well, what better models to endorse green design than animals themselves? There are so many benefits of investing in green energy that a blog post may not ne sufficient to describe. Not only is it limited to cutting carbon emmissions, but extends to creating healthier environments and living conditions, contributing tremendously towards cost reduction and even creating new job opportunities. As the focus on green energy is increasing among the world's leading corporates, more and more companies anre beginning to invest in these reliable, resilient and inexhaustible alternatives. When did birds become so smart ?